Lacking a hand...while needing three more!! Apparently, I can only type 24 words per minute---with ONE hand, that is :) You see, since becoming a nursing mom again, I' ve been re-learning how to do alot of stuff one-handed---like, typing, for instance, or eating dinner. Or reading books to my children. Or helping a little girl put on her shoes. Or spooning bites into a little boys mouth. Yep, I can now do all of that one-handed, while holding and nursing an infant in the other arm. Talk about multi-tasking! It was the first week of school, and I hadn't had hardly any sleep. My room-mate situation was not working out well at all, and my dorm-neighbors on my right side were night people. LOUD night people---like, playing loud music and having groups of people over at 2:00 a.m.--every night of the week! Well, we eventually resolved the sitation by moving me to a different room at the end of the hall where I could get some sleep at night and do some studying by day. Walking over to the chapel early in the morning, in the cool, crisp fall air, to practice on the grand piano before anyone else got there. Having music history study groups until late at night, trying to recognize the difference between a Bach piece and a Handel piece. Tuesday morning chapel services, where I dreaded having to sing with the chapel choir; praying that nobody could pick out my horrible singing voice. Sitting in my music theory class, trying to take good notes from our professor, who was the best teacher ever. I learned sooo much from him! Hi Everybody, this is Eli! My Mommy is pretty tired from taking care of me all day, so I thought I'd tell you myself about what kind of a day I had. 1. First, I woke up and decided to reject mom's offer of scrambled eggs for breakfast. I saw that Daddy was hiding some Lucky Charms in the kitchen and had some of those instead. 3. Cosette decided that she couldn't find any paper to write on, so she decided to write all over me instead--with a pen! She drew circles on my forehead, squiggly lines on my cheeks, and all kinds of scribbly marks on my arms. I didn't like it much when Mom had to scrub it off later. 4. Later, after lunch, Mommy and me and Cosette and Noah took a walk. I tripped over Cosette's feet and fell face-first on the pavement. I've got two nice red-marks on my face to prove it, too. 6. I decided I liked the taste of my toothpaste, and so I thought I'd eat some of it. OKAY, ALOT of it! Mommy was pretty upset about that. But, she said that the toothpaste didn't have fluoride or anything else bad in it, so I was safe. But, I did get an upset tummy later on.....I think I've learned my lesson--no more eating toothpaste! Me: "Cosette, did you see how your cousin just slid down that pole? I bet you could do it like that too if you tried. Me: Eli, do you want to go to Benjamin's birthday party on Sunday? Me: No, Eli, you already had your birthday this year. Eli (a bit more earnestly): MY birfday! Me: No, Eli, Sunday is Benjamin's birthday, not your's. Your birthday is in May. Eli (putting his head down on his arm and sobbing in disappointment ) MY BIRFDAY!! On Saturday: Eli, running up to my mom with a little tire in his hand that belongs on one of his trucks. It fit his finger perfectly. He said, "Marry me, Grandma?" The other day, Eli was spitting milk bubbles at Cosette. She put her hands on her hips and said ''Eli, the Bible says you should not spit milk bubbles at your sister!" She has this habit of making the Bible say whatever is convenient to her at the time!! Needless to say, we relish the second kind of day around our house! Today, I didn't get to jog on my tread mill; Today, I DID take a walk down the road with all three of my precious children, while holding my daughter's hand, and listening to her giggle while I told her how pretty she looked today in her new dress. Today, I didn't get to finish my book; Today, I DID snuggle up on the couch and read two chapters of 'Owl at Home' to my curious children. Today, I didn't get all of my laundry finished; Today, I DID marvel at how a certain little baby is quickly growing out of his newborn clothes. Today, I didn't get my batch of bread made: Today, I DID sit and enjoy a warm lunch of soup out of a can with my kids. Tonight, I didn't get around to watching that instructional video I've been meaning to; Tonight, I DID curl up with my husband and read another chapter out of a book together. Oh yeah, nurse baby, diaper baby, burp baby, love baby, etc, etc. Several things I am excited about today? First of all, the huge pile of clothes we bought at GoodWill over the weekend! Cosette had grown out of all of her fall clothes from last year, so she was despertly in need of some new stuff. I love GoodWill! We found her new-looking clothes for a fraction of a fraction of what it would have cost elsewhere! She is now fully 'ward-robed' for fall and winter! We bought two bike trailers for the kids . Joel and I have not been on our bikes for almost five years! (since we were married). We decided we'd like to be able to do some more 'physical', outdoors types of activities with the kids this fall, so we splurged and bought the bike trailers. We tried them out last night and loved it!! Cosette and Eli sit in one together, and Noah's car-seat straps securely in the other one. FUN, FUN, FUN! Fall weather. I love it! It's coming quickly, too. I told Joel just yesterday that I'm ready for sweaters, candles, warm apple pies, soup, etc. etc. Can you tell that I enoy fall? Noah-- He had his two month check-up today. He weighed 12 pounds, 10 ounces. He was literally off the charts as far as heighth. I'm sure he'll grow out of that, though (no pun intended! ), since neither Joel or I are tall people! He is smiling and laughing alot now, and responds much more to your face. Eli--He is a copycat!!! We all have to watch what we say and do, because Eli will copy, copy, copy!! It annoys Cosette a little, but I try to explain to her that Eli is simply learning from her, and she must be careful to teach him 'good things'. The other day, she dropped her apple and said "Oops, my apple" Eli watched her closely, then threw his apple on the floor and said 'Oops, my apple too!' Good grief! He is also in the 'why' stage. He must ask this question a thousand times every day, and I am left to try to find ways to explain everything. He is also my little sweetheart. He is always the first to say 'Up, Mommy', to want to cuddle, or to give me kisses. Cosette--I was sooo proud of her yesterday! At breakfast, she ran over to the pantry shelf, begging to have a fruit bar for breakfast. Eli ran along behind her, wanting one too. But she pulled the box off of the shelf, and saw that there was just one fruit bar left. First, she had a look of disappointment, but then she smiled and said "It's okay Eli, you can have this one!" Talk about a proud mommy moment! Then, later in the day, she offered to split her chocolate chip cookie with him as well. I am so happy when I see this generous, kind nature in her. I hope that it continues to grow and mature right along with her! She was excited last Sunday to be promoted to the 'big kids' Sunday School class. I think she was really ready for this, and it should be really good for her. Jaime---Still learning how to manage three little ones, and to still have a happy, loving face for my husband when he gets home! This is the busy time of year for Joel, so my days are longer than they might normally be. I am learning to be content only getting done what I really can around the house, and simply loving being a mommy to my three children. One thing that has suffered since Noah was born is my daily quiet time. I still manage to fit it in every day, but don't feel like I can concentrate for as long a period of time as I used to. Either I find myself nursing Noah while I'm praying, or he starts crying while I'm reading, or whatever. I'm considering trying to break it up during the day--instead of one longer time in the morning, maybe a few shorter times throughout the day. I'm hoping to purchase the Bible on CD soon, so I can listen to it throughout the day while I'm cleaning and cooking, etc. I think it'll be a great way to stay more deeply in God's Word. Anyone else have suggestions? I am escaping---into the world of blogs, that is. It was rainy today. We were all stuck inside. I spent the whole day saying things like "Do NOT bite your brother", and "Tell Mommy you need to go potty next time!" I did laundry, I fixed breakfast, lunch and dinner, I helped a 3 year old with her 'schoolwork', I nursed a baby ALL day long, I worked hard to keep a busy two year old happy, playing safe, and out of trouble, I started working on our budget, although I didn't get it finished (being interrupted to nurse again), I even had a plateful of ooey gooey chocolate chip cookies waiting for my husband.....and now, Nobody is allowed to bother mommy. Joel is in charge for a half hour. I am sitting on my bed, in the peace and quiet, escaping into 'blogworld'. I will enjoy all of your blogs--I will read about your days with your own children, I will read a quad-moms blog and thank God that I only have three right now, I will read your intellectual blogs and pretend that I am some highly scholastic type of person, I will read your political opinions and decide whether or not I agree. You will make me think, cry and laugh. And then, when I am done, I will thank God for the blogging world. I will disconnect, and return to my real life. I will read my children Bible Stories, brush their teeth and put them to bed. I will fix myself a cup of peach tea, and curl up on the couch beside my loving husband. You see, some days are hard, (rainy days are especially so), but in the end, I always remember that God has greatly blessed me, and my family is wonderful. Thank you for the 'escape moments', friends, and Thank You God for my real life!! always pulls up a chair and says "Help too, mommy?" 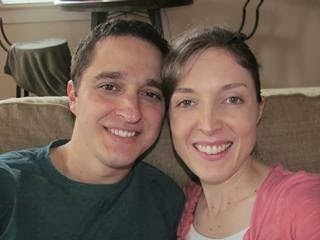 First and foremost, Joel's sister's husband is now home from El Salvador! He had been down there for a couple of years (due to details which I will not go into here), and we were all anxiously awaiting his return (of course, nobody as much as his wife and daughters!!). We were all so pleased to welcome him home this past Sunday. It was a time of GREAT rejoicing for all of the family, and it was so great to see him again interacting with his kids and loving his wife. What a sweet time! Welcome home, Armando!! Eli's vocabulary has suddenly sky-rocketed, or so it seems. Within the space of about two weeks, he went from rubbing his head and saying 'Ow, Mommy', to 'I bumped my head right here, Mommy!' Big difference! Joel and I are loving it. He says such sweet things, like: 1. For Cosette, he says 'Ette', 2. For banana, he says 'nana' 3. For 'Noah Shaun', he says 'Noah On' 4. For 'I love you', he says 'I wuv you!' It's so precious. Yes, I know, every two year old in the world goes through this stage, but it's even sweeter when it's YOUR two year old! Cosette had her first sleep-over with her cousin two nights ago. They had a blast! They both slept in Cosette's bed, and nobody fell out of bed, so that was a plus! ;) Hearing them giggling and laughing together made me remember my own days as a little girl, begging my parents to let my cousin Jenny stay over. We used to have so much fun together! (Yes, we argued and fought a lot as well, but we always ended up 'best friends' by the end of the sleepover!) Jenny is due to have their first baby, a girl, in just a few weeks, and I am so excited for her! I can't believe we've both grown up from little girls having sleep overs to mothers with families of our own! Original cause of war: Experts disagree. There are two main theories. One is that the fruit flies were attracted due to some garbage bags left in the outside basement stairwell. Another main theory is that they arrived due to some over-ripe bananas left on the kitchen counter. Plan of Action: Remove all trash cans from the house; Remove all wet or damp towels from the house; Completely clean off coutnertops, scrub down with vinegar; put all food or food related items in the refrigerator; Hang several fly papers around the house; set a fruit trap for them on the kitchen stove; do not eat or cook at our house until said flies have been annihilated.